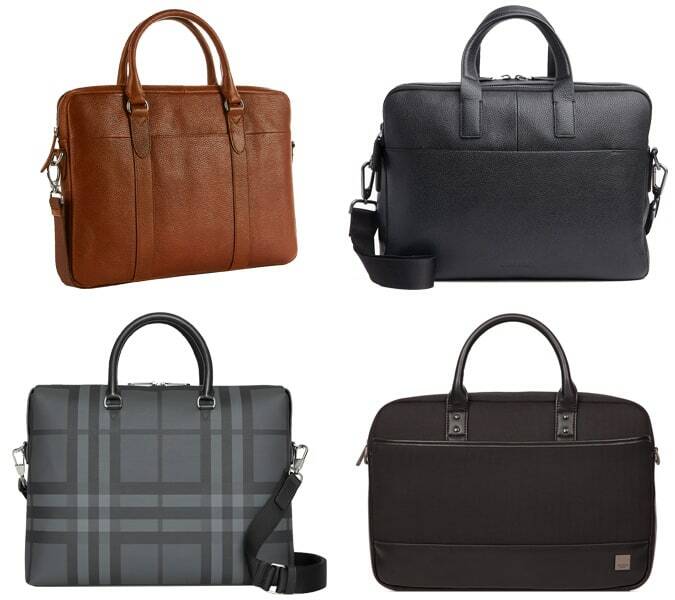 For most guys, a laptop is part of the daily arsenal – an essential tool for 21st-century life. But even if you’re no stranger to swinging a kettlebell around your head, there’s no escaping the heft this poses. If you need to lug the thing around all day (the laptop, not the kettlebell, that is), you’ll need a laptop bag. It’s not as simple as grabbing any old style off the peg. You want something that’s practical – a bag that will both keep your laptop safe and is easy to carry – but also something that’s good looking and bang-(or should that be bag?)-on-trend. Depending on your job or lifestyle, there are all sorts to choose from: minimal and stylish for slinking around the city; robust and stuffed with features for stashing extra gadgets; or roomy and multi-purpose for the man with an action-packed life. From no-nonsense messengers and retro backpacks to buff briefcases and excellent, err, totes, these are the best laptop bags in every style, for every need. An old-school backpack is still the go-to bag for many fellas. No longer just for those with an active lifestyle – though, if you’re the type of man who’s hitting the gym, or walking and cycling fair distances, a backpack will give your shoulders that extra support – it’s also an ideal laptop bag. Padded straps for comfort are a bonus, but equally important is checking if the bag is actually waterproof (as opposed to just water resistant – not the same thing) and looking for extras like additional pockets or zip-fastened compartments. Different backpacks will offer different levels of protection for your laptop. While some go all out on practical padding, others will come with a thinner fabric lining. This may be the difference between choosing a bag from a fashion brand, which will be more about form than function, or a brand that’s dedicated to keeping your protected against the outside. Perhaps best suited for the commuter or man in the city, an over the shoulder messenger bag is all about simplicity. The laptop-friendly carrier will generally fall into one of two categories: the more stylish shoulder bags that happen to have space or a sleeve to accommodate a laptop, or purpose-built shoulder bags designed with carrying laptops and accessories in mind. Which type you go for will likely depend on both your overall style and your tech requirements. If you need all the bells and whistles, look for something loaded up with additional compartments – a bulkier but nonetheless practical option. A leather messenger bag will offer the best quality (avoid imitation options, which are prone to peeling) while a reinforced base will make it even more durable. Arguably most important when buying online or without your laptop to hand is checking the sizing. If your laptop has a big screen – a full 16-incher, for instance – make sure it will fit. It’s official, the briefcase is back. But before you run away, allow us to explain. We’re not talking about the fusty old businessman’s hard shell briefcase, but a contemporary take for the modern professional man – one that’s softer, more design-led, but no-less smart. For the classic look, a neutral colour (such as brown or black) with a handheld design is the way to go – though some will come with a detachable shoulder strap, giving you essentially the posh older brother of the more casual messenger bag. For something dedicated to ferrying a laptop around town, look to big name luggage brands. Or, for something that’ll slot in seamlessly with a smart-casual outfit too, tap up fashion brands for something that’s still built for business, with all the additional compartments and features for the rest of your work gear. There’s something sweetly nostalgic about a satchel – a call-back to simpler schoolboy times (fish fingers, anyone?) while having an excuse to tap the retro trend. Not that it’s all primary colours and velcro fastenings, mind. The satchel has also grown up. Like the messenger bag, the satchel is usually a shoulder-strapped bag. But the defining feature is a buckle or fastening, which gives extra security – especially important if you’re carrying an expensive laptop around the big smoke. Packed with extra pockets and compartments, the satchel can keep you well organised. And with styles rendered in materials from leather to waxed cotton, they’re often high-quality and, as such, are a dab hand at keeping your laptop safe and protected. For guys who already have every other type of bag but want to make sure their laptop isn’t banging around inside, a slick looking sleeve is an absolute must. Forget the free one they throw in at the electrical store, there are some seriously stylish and high-quality pieces out there. The best examples are to be made from leather, or another equally strong and durable material, with a soft protective interior lining and extra pockets for easy access to things like cables. The added benefit of buying a sleeve is that they’re often so good-looking that you can also use them as a clutch (how very #menswear of you), rather than simply hiding them inside your bag. Re-appropriated from the world of women’s fashion, the tote bag has become a staple accessory for many guys. It’s not hard to see why, either: there’s serious depth to the benefits of the tote (quite literally), because there’s a deceptively large amount of space within the basic design. Having realised it as an easy way to add a much-welcomed pop of colour to an otherwise plain outfit, designers from the affordable end of the high street right up to designer labels (for which you’ll pay about the same as a month’s rent) have been getting in on the tote act. Regardless of how much you part with, the tote is about the quick-and-easy carry. A one-size-fits-all bag of convenience that you can chuck your laptop and everything else in (don’t forget that sleeve) when you’re on-the-go. Previous articleCasual and Luxury -Where is the Balance?